What that means is that I read a lot. When I am anxious, I read. 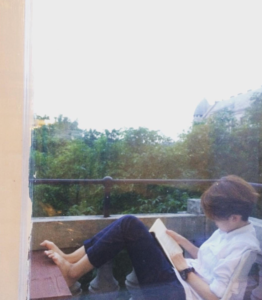 When I am sad, I read. When I am confused, I read. When I feel like there is no hope left in this world, I read. It is one of the core beliefs in my life that a book can save lives. And it probably has saved my life, in more ways than I can imagine. Here are some of the books I have read over the last few years that have shaped my thinking, altered my path, brightened my days, and made my life better. I’m sharing them with you in the hopes that they might play the same role in your life. I have always had different ideas about “work” and what it really means. This book confirms my thesis. I read this book on the plane and got whipped into such a frenzy I wanted to get off the plane immediately so I could start changing my life already, simply because Ferriss is such a motivating writer. Not only that, he also really lives what he writes. If you are hoping to get out of the rat race and build a life doing your own thing, this is one of the books you must read. 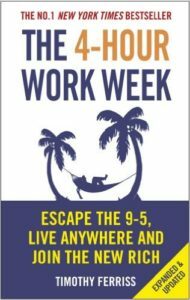 Think of it as essential reading for the “How to Get Out of the Rat Race and Live a Great Life 101” course that never existed back when we were in school (how we needed such a course!). One of the best books I have ever read on productivity. More than that, it goes right to the heart of how to live a good life. 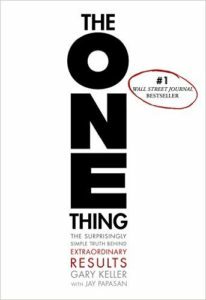 As an aspiring minimalist, I’m enamored with Keller’s almost zen-like, minimalist philosophy of the ONE Thing. Stop doing what’s unnecessary and focus on doing what’s necessary, and you will be able to achieve 80% of your desired results with just 20% of your effort – that’s the central premise of this book. In other words, FOCUS on the things that matter. This is something I’m trying to out into practice in my life right now. I read this short book in one sitting in the library (yes I couldn’t even make it out the doors of the library without devouring it). 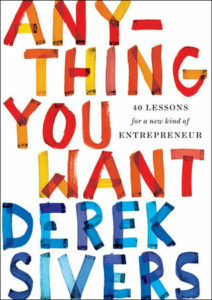 This book houses Sivers’ thoughts on what it takes to build a successful business in a human, uncorporate way. One of his key ideas is that you should build a business that people are begging you to start. Just this idea itself is enough food for thought for a long time. Money has become one of my pet topics. 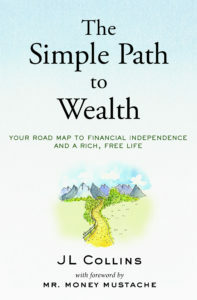 From being disdainful of money to realizing its utter importance, I have come a long way. Books have been a huge part of my financial re-education (apart from the Internet). There are a lot of books about money – and I have read quite a few – but very few are as heartfelt and easy to read (and understand) as this. Collins’ advice is as old as time. Read it, digest it, live it, and instead of being money’s slave – which most of us have become – you will learn to make money work for you. If you suffer from anxiety and panic attacks, and you have tried everything and nothing has worked, please give this book a read. I suffered from serious anxiety and frequent panic attacks some years ago. I made no real progress in recovering from it no matter what I did. Until I read Paul David’s writing. 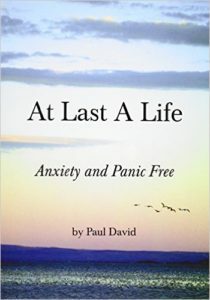 He also suffered from anxiety for 10 years until he stumbled into his own recovery. 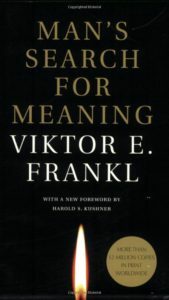 I don’t want to paraphrase him – I’m worried that I won’t be able to express his ideas well – so go and read this book. You can also visit his website, which has plenty of information as well. This is one of those moments when I can actually say, “this book saved my life”. 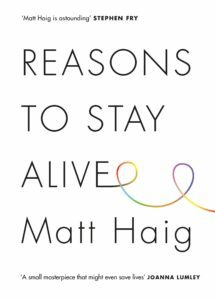 Matt Haig was so deeply depressed he almost killed himself. He went on to live and write this book, that has in turn helped so many other people who almost, but didn’t, kill themselves. This book always reminds me of the power and beauty of words to help change people’s lives. And this book also is an ode to hope. I loved it so much I gifted it to a friend who I thought needed it. I really, really, really love this book and have a huge soft spot for it. I first read it when I was maybe 12. It was nuts – I spent the whole night feverishly flipping the pages, lost in the story. Then I reread it many years later when I was maybe 25. I thought the story would lose its magic. But it didn’t. 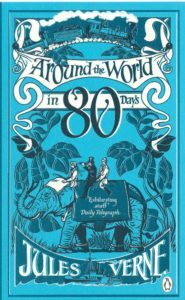 This book imparts a sense of adventure and an appetite for life that is so vivid, it makes you want to hop on a train or a ship as well and see the world for yourself. I also think this book is about passion and doing and dreaming. I won’t go on and on – go and read and experience this book yourself. A book that cannot be written about lightly. A book that must be treated with respect, since it was a book that was written with great respect. About life. About suffering. About joy. About joy in the midst of life’s suffering. I will come back to this book again and again throughout my life, hoping to learn and relearn its lessons. 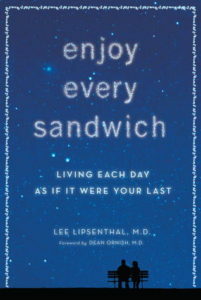 Lee Lipsenthal loved life, even when he was dying. Somehow, with a cancer diagnosis, and while facing down the throat of mortality, he was able to find light and joy and happiness and peace and humor. He is my role model, and I hope to be like him when it comes to my turn to face death. Also, this book has such a beautiful cover – one of my favorites. I gave away my copy but I will buy one again for my library. It deserves a place on my shelf (and a re-read every few years). Thich Naht Hanh is a Vietnamese monk whose writing has deeply influenced me. His voice is a balm and a calming presence in a noisy, sometimes scary world. 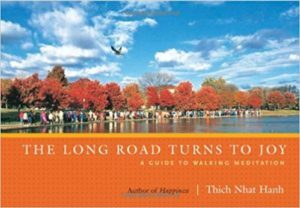 Any book of his is worth reading, but I particularly enjoyed this book because I also enjoy walking. It is a most wonderful experience walking with his words in mind. Knowing how to even start meditating is even harder. 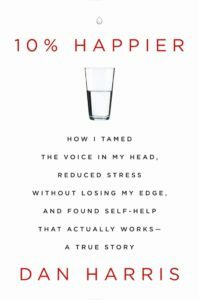 This book by Dan Harris (who suffered a meltdown on national TV and who later found great peace through meditation) demystifies meditation and successfully explains – or at least this book finally made me successfully understand – what meditation is and how I can start to meditate effectively. Even if you hate airy fairy things like meditation, but want to have a quieter, more peaceful mind, give this book a read. You might be pleasantly surprised. 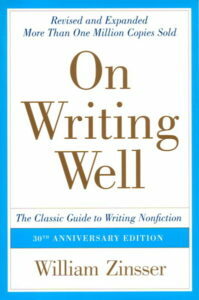 If you want to become a better writer, read this book. It has never been particularly fun to read about writing, but Zinsser is such a good writer he makes a book about writing interesting, even unputdownable (how I love this word). I have made it my personal mission to read all of Zinsser’s books. That’s how much I love him. I don’t know what I would do if books didn’t exist in this world. In my darkest moments, books have been there, pouring light through the cracks. Books have been a kind of true north for me. They have been a friend, a teacher, a guide. I sincerely hope that you too can discover the joy of being a life-long reader. And the prime joy being… the discovery of an answer written in a book, to a question that is hidden in your heart. 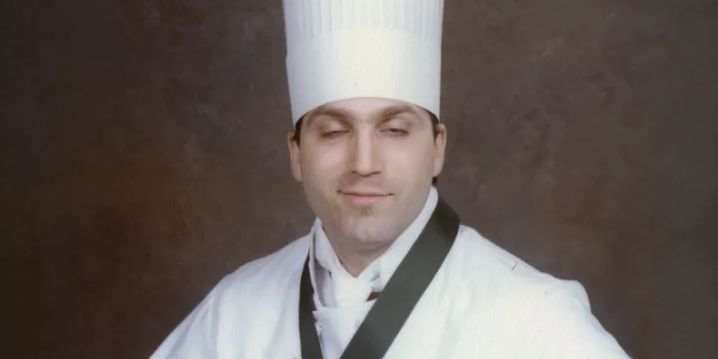 Ivan Orkin in culinary school. I love this photo. I love watching Chef’s Table on Netflix. I love seeing how just one thing – cooking – can become the source of so much joy, frustration, achievement, failure. In other words, an entire universe. For many (if not all) of these chefs, cooking is something upon which they build their entire lives. In the recent episode I watched, ramen chef Ivan Orkin had a difficult childhood. As a kid, no one expected much of him. He drifted until, one day, he became obsessed with… ramen. This obsession was pivotal because it led to him unlocking the discipline and focus that were previously missing in his life. He later opened his own ramen shop in Japan and gained success as being “one of the best ramen makers on the planet”. Just this one thing – cooking ramen well – has transformed Orkin’s life. So, this week’s food for thought: Instead of wanting to do or be many things, why not work at becoming really good – single-mindedly good – at one thing? Why not be an expert at writing about food (and only food)? Why not be so good at teaching cycling that you are at the top of people’s mind whenever anyone wants to learn to ride a bike? Once you can be known for being good at one thing, this one thing can then become a platform, a stepping board, to other things.